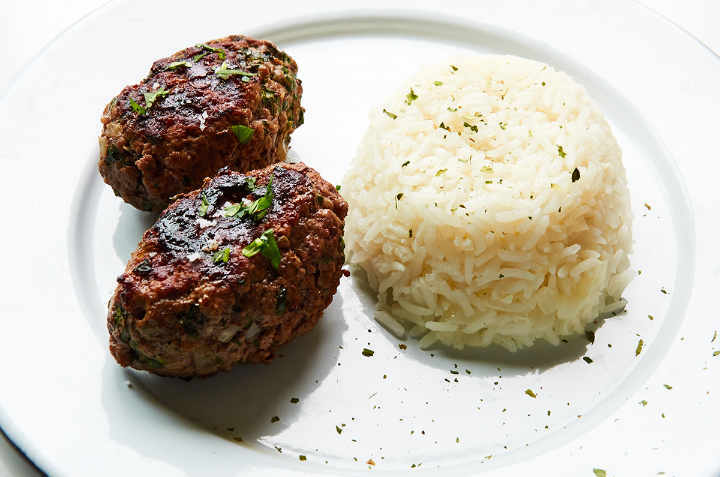 Mexican style pan-fried meatballs stuffed with onion and cilantro, a simple dish that is easy to adapt to your tastes. Add some serrano chile, a touch of garlic, some crumbled queso fresco, or even some chopped chipotle peppers. Preparation is less than 30 minutes from start-to-finish to clean up. 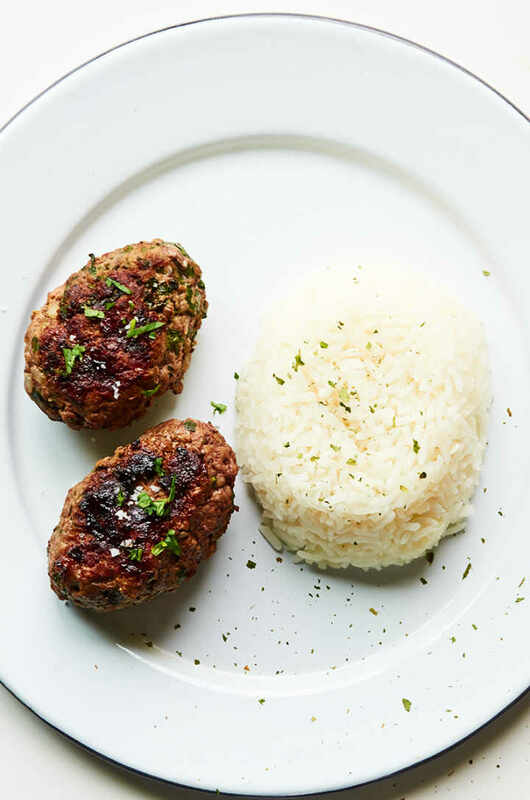 These meatballs differ from the classic albóndigas as that rice isn’t mixed in with the ground beef and that each meatball doesn’t have a bit of hard-boiled egg in the center. Remove the stems from the cilantro then finely chop the onion and cilantro. 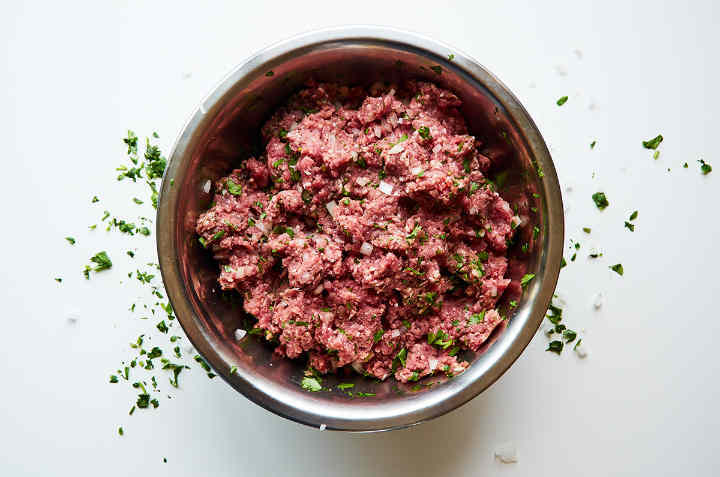 Reserve 1 teaspoon of cilantro to use to garnish the meatballs when served. Thoroughly mix the ingredients with your hands. Gently compact the meat while mixing. Divide the mixture into 12 evenly sized balls. 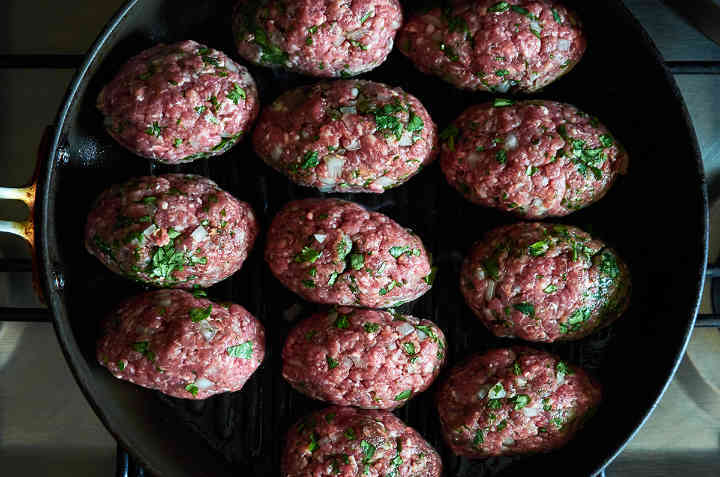 Use your hands to shape each ball into a slightly flattened egg-shaped pattie. 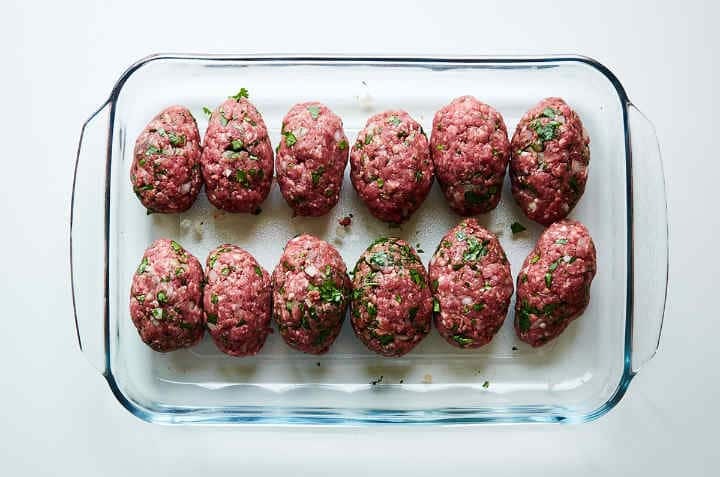 Refrigerate the meatballs for 30 minutes to one hour. 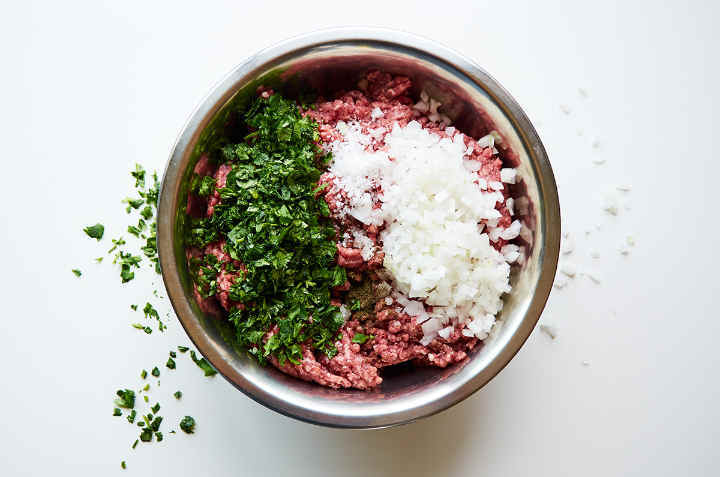 This step helps keep the meatballs together during cooking and allows the flavor from the onion and cilantro permeate the meat. 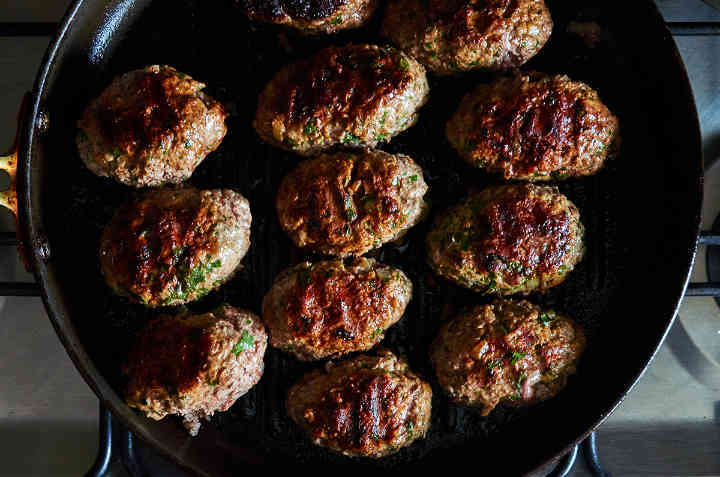 Preheat 5 tablespoons of oil your frying pan to medium-hot then place the meatballs in the pan. Cook for 5 minutes until nicely browned. Turn the meatballs and cook for 5 more minutes. 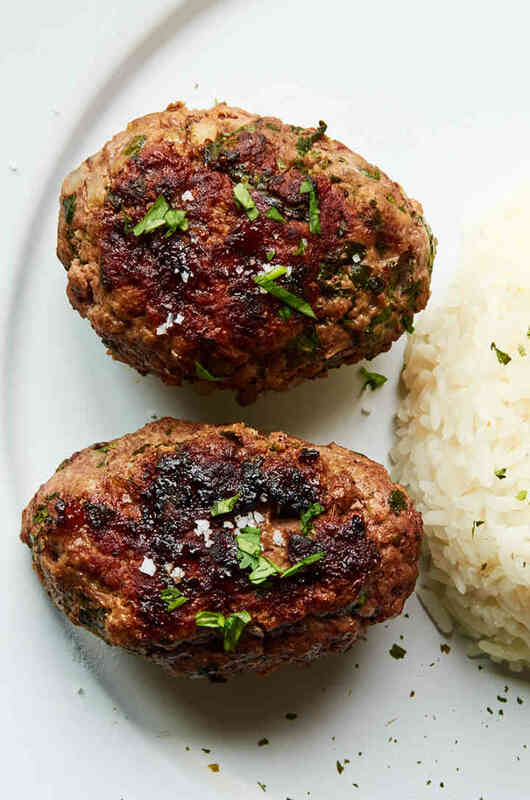 Serve the meatballs with a side or rice or refried beans and your favorite salsa if you wish. 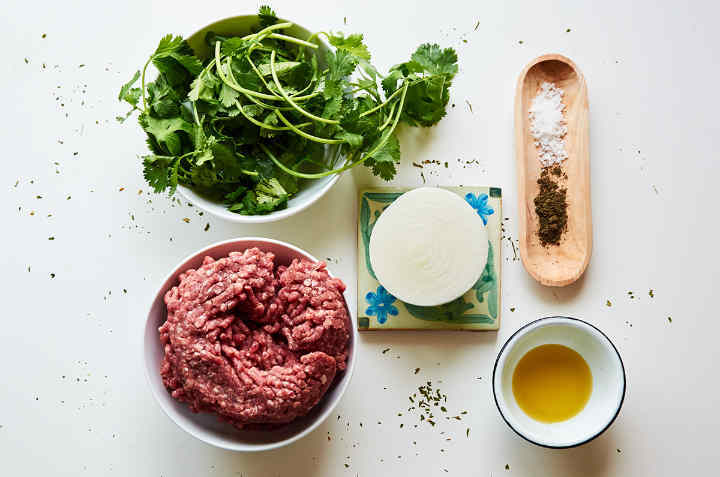 Decorate the meatballs with a few bits of the reserved cilantro. Spicy – Very finely chop 1/2 serrano pepper and mix with the other ingredients. Garlicky – Very finely chop 2 cloves of garlic and mix with the other ingredients. Cheesy – Crumble 3 ounces of queso fresco and mix well with the other ingredients. Smoky – Chop two canned chipotle peppers in adobo and mix well with the other ingredients. 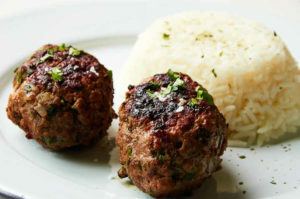 Mexican style pan-fried meatballs stuffed with onion and cilantro, a simple dish that is easy to adapt to your tastes. Add some serrano chile, a touch of garlic, or some crumbled queso fresco. Preparation is less than 30 minutes from start-to-finish to clean up. 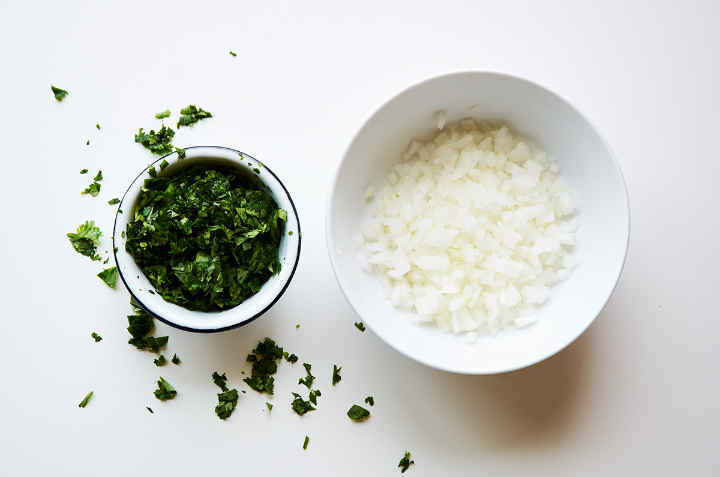 Remove the stems from the cilantro then finely chop the onion and cilantro. Reserve 1 tsp. of cilantro to use to garnish the meatballs when served. 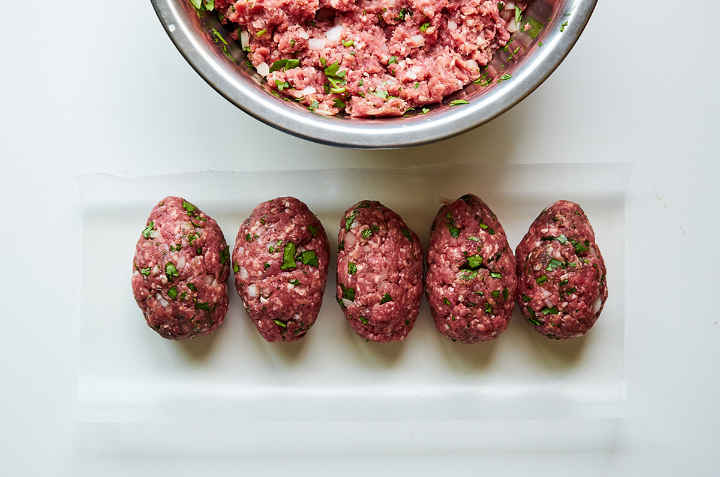 Refrigerate the meatballs for 30 minutes to one hour. We prefer standard ground beef to low fat ground beef because it makes a juicier meatball. Spicy - Very finely chop 1/2 serrano pepper and mix with the other ingredients. Garlicky - Very finely chop 2 cloves of garlic and mix with the other ingredients. Cheesy - Crumble 3 ounces of queso fresco and mix well with the other ingredients. Smoky - Chop two canned chipotle peppers in adobo and mix well with the other ingredients.